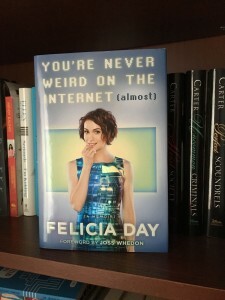 This book nook is all about the wonderful memoir You’re Never Weird on the Internet (almost) by Felicia Day. Now if you don’t know who Felicia Day is, she is a wonderful, quirky person who can be found mainly on the YouTube channel Geek and Sundry. I actually stumbled across her when I was going through the Tabletop game videos on the Geek and Sundry and saw her shows Co-Optitude (where she plays video games with her brother) and The Flog (where she steps out of her comfort zone to try new activities). When I heard about her new book coming out I couldn’t wait to get my hands on it and give it a good flip through. This book is a memoir for Felicia Day’s earlier years. The stories she covers are very real and extremely relatable. She really delves deep into issues that many have probably experienced, but no one really talks about. Having different interests than your peers, not really fitting in, struggling as an adult to find your niche, even working in the internet age with people who don’t really understand what you do. This book was honestly so well written. It was everything I could ever hope for in a memoir (okay I might be getting a little theatrical here, but it was honestly that good). It really added dimension to the quirky awesome girl I’d watch on YouTube. To know that she had gone through so much in her life really made me think about my own life and my goals for the future. I would honestly recommend this You’re Never Weird on the Internet (almost) to everyone. If you’re nerdy, geeky, odd, different, ever had issues fitting in, dealt with depression, or just love to read I suggest you pick up this book. I’m pretty sure you’ll love it (almost) as much as I do. It’s Blogmas day 3! Today I thought I would give a review on a book that I actually got last Christmas. 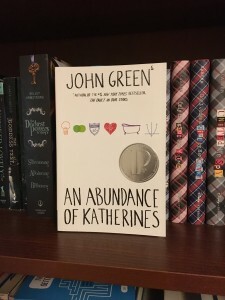 The book is written by John Green and is called An Abundance of Katherines. This book is actually known as John Green’s least popular YA book. It doesn’t have much of a following and many YA readers have said they just didn’t enjoy the book. However, that did not deter me. The book is about a teenager who loves anagrams, was a child prodigy, and dated only girls named Kathrine. In fact, he has been dumped nineteen times by Katherines. After being dumped on graduation day he goes on a road trip with his best friend which doesn’t go as planned. Through this all he is trying to develop a mathematical formula to predict the future of any relationship, avenge Dumpees, and ideally win him the girl. Reading this book I can see why it isn’t as popular with the YA crowd. While you don’t have to understand the math or anagrams to read the book, it can make it harder to get through. However, I absolutely loved this book. I liked how they used real mathematics and incorporated it into the storyline. Since I dabbled a bit in University calculus and physics, I found it just added another level to the book and made it even more enjoyable. The storyline was also pretty good, though it is a YA book so it’s nothing too in depth or earth-shattering. I think this book was just made to cater to the wrong age group. Had this been tweaked to be more of an older teen to adult kind of book I think it would have been more well received. I say if you love anagrams, or math (or just attended a basic calculus class) you’ll probably enjoy this book. However if you don’t like YA books or if math, anagrams, or higher level thinking in a YA book isn’t your thing then I suggest passing over An Abundance of Katherines and checking out one of John Green’s other novels. So this is going to be a quick review of the book by Gace Helbig. 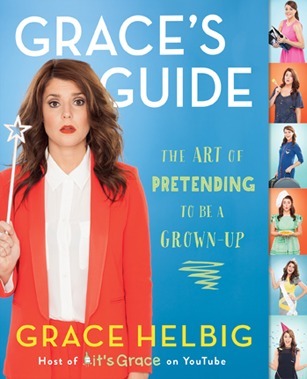 Grace’s Guide: The Art of Pretending To be a Grownup is a comedic version of a self-help book. Though this book Grace gives the reader tips on how to survive as a grownup and look like a functioning adult in the process. She uses stories from her own life and her quirky sense of humor to guide the readers through all her mishaps and blunders. Though this is a book by a YouTuber, I actually quite enjoyed the book. There were only 3 books from youtubers that I was actually looking forward to reading (two aren’t out in my country yet), and this was one of them. I really liked Grace’s sense of humor throughout the book. It was a lighthearted book that was quick to read and was extremely entertaining. Between the quirky humor I found myself agreeing with a lot of her tips in this book. I definitely suggest this book if you want a lighthearted book with personal blunders that doesn’t take itself too seriously. So this is going to be a quick review of the movie The Fault In Our Stars. To start with, I have read the book this movie is based off of, so I knew what was going to happen in the end. Yet, I still put myself through that torture. The movie was extremely accurate to the book. The author, John Green, even makes a cute and short cameo in the movie. I don’t want to leave any spoilers, though the Internet is riddled with them, but the movie was both wonderful and heartbreaking. 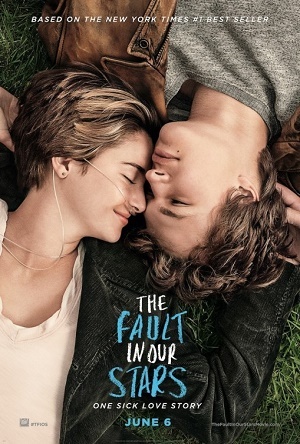 I saw on a nerdfighter page that some people would stop the movie after Augustus reads the note from Hazel on his bedside table in Amsterdam. That you could stop the story and just go on to believe they lived happily ever after and nothing bad ever happens. I wish I could do that, but I know that’s not how the story ends. The struggle and heartbreak is so realistic, admirable, and moving. I loved this movie, and would highly suggest watching it if you’re in the mood for a sad but truthful movie. However, I warn you all that you will probably spend the rest of the day contemplating the inevitability of oblivion (like I am right now). Not exactly the most uplifting thing, but sometimes we just need a dose of hard reality.